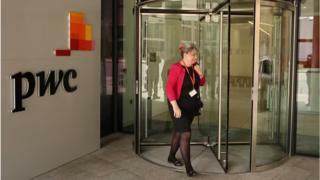 Image caption PwC hopes more flexibility will help it recruit "better people"
Accountancy giant PwC has launched a scheme that allows some new recruits to work the hours they want. The Flexible Talent Network allows people to list their skills and preferred work pattern when they apply. PwC says the aim is to attract skilled people who don't want to be tied to traditional 9-to-5 hours. Flexible working patterns can include anything from shorter weekly working hours, to only working for a few months a year. PwC, which will match recruits to relevant projects rather than specific roles, hopes the move will give more diverse talent a route into the firm. PwC, one of the so-called Big Four accountancy giants, said that it decided to embrace the gig economy after a study it carried out showed that almost 46% of 2,000 respondents prioritised flexible working hours and a good work-life balance the most when choosing a job. So far, more than 2,000 people have registered with the new network in the two weeks since the initiative was launched. Apart from the flexible working scheme, PwC is also recruiting for its six-month paid senior internship programme Back to Business, which is designed to help senior professionals to restart their career after an extended break. PwC's chief people officer, Laura Hinton, said: "People assume that to work at a big firm they need to follow traditional working patterns - we want to make it clear that this isn't the case. In order to recruit the best people, we recognise that we need to offer greater flexibility, different working options and a route back in for those looking to restart their careers." Offering flexible working was not only good for staff, but also good for business, the economy and ultimately society, she said. "We're likely to see a rise in people transitioning in and out of work throughout their careers and those organisations who responsibly support their people to do this will ultimately gain a competitive advantage," Ms Hinton added. PwC said that it is looking for a wide variety of skills, as the projects it undertakes for clients are varied. Skills required range from qualified accountants with experience of auditing who can step in to support its permanent staff during busy periods, to people with experience in project management, digital and IT. For example, one Flexible Talent Network member was studying in London to become a financial analyst while raising two young children. PwC has employed her on a 100-day contract, where she worked for 10 days in November to familiarise herself with PwC's processes. She then returned to her home country, China, to visit family in December, returning in January to work the remaining 90 days for PwC during the "busy season". This employee is now focusing on her exams, and will return in October to start another 100-day contract with PwC. Work emails: Are you still 'out of office' on your commute?